Celebrate Martin Luther King Jr. Day! President Ronald Reagan signed this holiday into law in 1983. Communities all over Texas have a Day of Service. Google to find an opportunity to get involved! Do something special to celebrate the life of Dr. King who gave his life for Civil Rights! Join with your community at a parade! Discover something new about the history of civil rights in your community. Go to a museum. Attend a parade! Enjoy a history channel show with your family. Be inspired in your advocacy by those who fought for civil rights! Then read the article by the Texas Tribune that Once again, the Texas Legislature is mostly white, male, middle-aged. 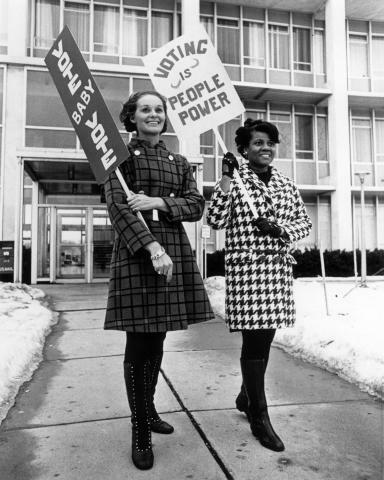 Oct. 19, 2019 is the 100th anniversary of the League of Women Voters of Texas. Our work empowering voters and defending democracy is incredibly important today. You and I can build better and healthier democracy -- where everyone’s voice is heard -- by staying involved and letting our Texas elected officials know our views. Your State Senator & State Representative Wants to Hear from YOU – Tell Them Texas Needs Modern & Secure Elections! Send your elected officials an email by clicking here! Sign the petition! Show your support of the For The People Act (H.R. 1)! Read LWVUS’ letter supporting For The People Act (H.R. 1). LWVUS has joined with a coalition of groups collecting signatures in support of H.R. 1. Add your name to the petition and help us build support for this comprehensive piece of democracy reform legislation. For the League talking points on H.R.1, click here. Check out Redistricting/Census Issue Chair Stephanie Swanson's update on the League Advocacy webpages and click here to send a message to your legislators. Over 400 emails have already gone out to Texas legislators on this issue last week. Keep it going! Learn how YOU can make an impact on legislation in Texas! Keep up on important issues by reading updates from our fantastic League volunteers from around the state! Our two top priorities for major improvements this session are: 1) Passage of electronic voter registration and 2) Improved voting equipment systems which include a voter-verified paper receipt. Texas is 41st in the nation in the School Finance and 42nd in the Chance for Success categories per the 2018 “Quality Counts” report. Reports on a new bill and a concurrent resolution to address climate change. Criminal Justice Elaine Talarski (San Antonio) We are following bills relating to reform in the criminal justice system for individuals arrested and charged with a misdemeanor and improvement in the care of the mentally ill individual arrested and jailed. Legislators are interested in marijuana for medical use according to Issue Chair. Keep up with all the issues! Delineates 3 areas of bills that have been introduced regarding child abuse: punishment for crimes against or involving children, directives for child protective services, and good faith reporting of child abuse. Notes bills related to problems with evidence handling in sexual assault cases and protective orders. Financing State Government - Ernie Wittwer (San Antonio Area). Eminent domain, flood control & planning and appropriations & planning for the Texas Parks and Wildlife Department are the key issues. The League is working with partners in coalition to introduce new provisions that strengthen Texas’ Sunshine Laws and improve public oversight. Watch the Capitol Action Minute video. We are tracking almost 200 transportation bills that have already been filed! Toll roads, drivers' licenses, vehicle and trailer registrations, child safety seats, memorial highways, and the creation of regional transportation authorities are all on the list. 21 - Martin Luther King, Jr. Day - Participate in events in your community.